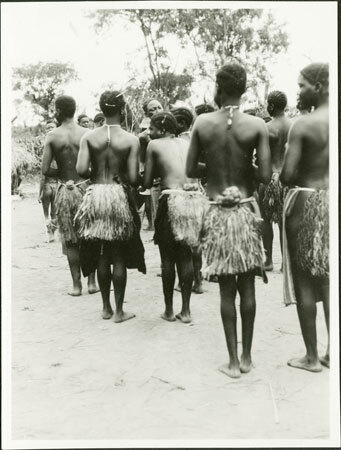 A group of young women at a dance dressed in barkcloth (agbaya) and textile (ramu) aprons with fibre tassles at rear. Morton, Chris. "Zande women at dance" Southern Sudan Project (in development). 03 Jan. 2006. Pitt Rivers Museum. <http://southernsudan.prm.ox.ac.uk/details/1998.341.103.2/>.